A new protocol from PathoGenetix, Inc. enables identification and strain typing of bacteria directly from clinical stool samples in five hours, without the need for a cultured isolate. The protocol has important applications in both public health and microbiome research, and is currently being evaluated by public health laboratories to assess utility. The protocol enables public health and microbiome research laboratories to determine serotype and strain type information for multiple bacteria directly from an enriched stool sample, in just five hours. PathoGenetix, Inc. has developed and validated a protocol for the identification and subtyping of bacteria directly from human clinical stool samples without prior cultural isolation. 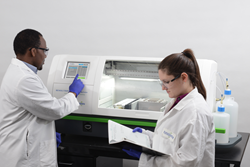 The protocol, which runs on the RESOLUTION™ System, enables public health and microbiome research laboratories to determine serotype and strain type information for multiple bacteria directly from an enriched stool sample, in just five hours. PathoGenetix’s RESOLUTION™ Microbial Genotyping System is based on proprietary Genome Sequence Scanning™ (GSS™) technology, which provides bacterial serotype identification and strain typing in five hours directly from complex mixtures. The level of discrimination between bacterial strain types provided by the System is comparable to pulsed field gel electrophoresis (PFGE), the current gold standard for pathogen typing in foodborne illness outbreak investigation and response. Because the System is culture independent, and fully automated from sample preparation to final report, it has the potential to greatly reduce the time, complexity and skill-level required to identify foodborne pathogens in public health labs monitoring foodborne outbreaks.